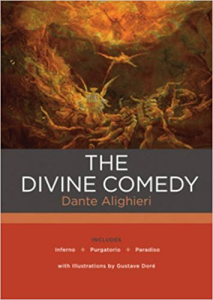 The Divine Comedy (Italian: Divina Commedia) is the title usually employed to designate an epic poem written by Dante Alighieri between 1308 and his death in 1321; the author's own title for the work was simply "Comedìa". The epithet Divina was later applied to it by Giovanni Boccaccio, and the first printed edition to add the word divine to the title was that of the Venetian humanist Lodovico Dolce, published in 1555 by Gabriele Giolito de' Ferrari. It is widely considered the preeminent work of Italian literature, and is seen as one of the greatest works of world literature.